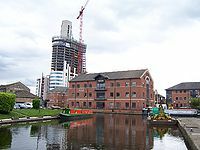 For those without comedic tastes, the "questionable parody" of this website called Wikipedia have an article about Leeds. On behalf of t' Yorkshire tourist board, we'd like to welcome you to t' Glorious City of Leeds, Pride of Yorkshire, shining jewel of t' Pennines, and bustling metropolis of a thousand surprises. This pamphlet will detail t' myriad delights of our fair city, including its long and rich history, its proud traditions, t' geography of its splendid surroundings in t' hallowed county of Yorkshire, its strong transport links, cultural and sporting achievements, and precisely why it is far superior to t' dump on t' other side of t' Pennines known as Manchester. Owt from t' other side o' t' Pennines is useless, unless it's an empty bus, having dumped its cargo of Mancunians on t' other side o' t' border. These principles have been proudly adhered to ever since. In its early days, Leeds mainly dealt in the manufacturing of woollen products - but not soft wool products, such as might be produced by those down South - this were proper Yorkshire wool, and were never soft! Many people used tough Yorkshire woollen clothing as a cheap, hard-wearing and durable alternative to chain mail and armour. You could never call a woollen sweater from Leeds comfy, but you could call it uncomfortable for a very long time before it wore out. Around the same time, across t' Pennines, those in Manchester were only interested in slacking off - they seem to take pride in the fact that t' oldest free library in the world opened in Manchester, when it clearly shows that Mancunians prefer bunking off for a quiet read instead of doing an honest day's work for an honest day's pay like t' hard-working, honest folk of Leeds. A comprehensive study into t' geography of Leeds has never been completed, largely due to t' fact that whenever t' surveyors reach Chapeltown, their equipment gets nicked. T' most important things you need to know about t' geography of Leeds is that it's bloody miles away from Manchester, and it's slap bang in God's own county, Yorkshire. Anyone not able to find it with those directions needs their bloody head examining. Street art, locally known as "graffiti", is among t' city's more notable contributions to t' art world. The artists are always readily identifiable by their distinctive signatures - indeed, in a daring post-modern twist, often the signature is the artwork. Leeds artists have always sought to innovate in their field, using t' city itself as their canvas, and whatever simple tools come to hand as their brushes. This has led to the city being positively festooned with such vibrant and original work as "Vandalised Bus Shelter", "Large Puddle of Beer Vomit", "Carpet of Broken Bottles", "Burned-Out Car on School Playing Field" and t' undoubted highlight, "Tramp Resplendent in Pool of Wee". Manchester, by contrast, has some bloke called Lowry, who was such a piss-poor artist he could only draw stick men. They named their art gallery after this loser, which we think tells you all you need to know about Manchester's understanding of art. Leeds can boast some of the finest restaurants in Europe. It is the home of the now worldwide brand of Harry Ramsdens. There is also the 3* Michelin rated Dixy Chicken shop at the top of Briggate, with queues of up to 15 minutes on a saturday night. or the local bin will do. If it's popular music you're after, Leeds is your place! With more Brass Bands per square mile than any other part of the country, any visitor can be assured of an aural experience like no other! However, if you're more interested in passing fads such as pop music, or jangly indie music, then your whims are also catered for. Leeds was t' scene of t' invention of goth music, led by t' gloom-laden sound of t' Sisters of Mercy, who ruled t' city for the whole decade. Goths have, of course, made a re-emergence t' become a common sight in many modern cities; and they are common in Leeds as well, the difference in Leeds is that they never went away in t' first place. And while Manchester inflicted t' sonic sedatives of indie on t' world - Oasis and t' Stone Roses, Leeds produced t' joyous sounds of James and, er, t' Wedding Present. OK, so technically t' Manchester bands may have sold a few more records, but t' sound will never last in t' way that t' Weddoes will - you mark our words! More recently, t' Kaiser Chiefs were unleashed upon an unwilling world. All attempts to get t' city t' take them back and forbid them from ever leaving again were refused, as t' Mayor, city residents and local animals were glad to be rid of t' Kaiser Chiefs. Also, the city saw it as a means for getting revenge on t' rest of the country for calling them 'Northern' and 'backward.' Similar tactics were employed with the unleashing of Chris Moyles. When travelling to Leeds try out some of the Leeds style by wearing some of the very common track suits and stained t-shirts. And to really get into the feel of Leeds style, try living with a look of having no self worth or any prospects in life.When in Leeds get the real feel of Leeds by drinking at any day, it's never too early top get wasted and urinate on yourself in puplic !. The main style of Leeds is to have no a job or any importance, and to really get a feel of Leeds try going on the popular freak show ,programme The Jeremy Kyle Show. Leeds is ideally situated to take advantage of practically every form of transport in t' known world. Leeds boasts a modern, well-respected and internationally renowned airport, which has been described by some locals as "a hive of cosmopolitan travellers", and by cosmopolitan travellers as "a hive of Yorkshire people off on cheap weekend trips to the continent". It is known as Leeds-Bradford International Airport, which is a magnanimous gesture from Leeds to their near neighbours, designed to allow them t' significant thrill of seeing their city's name near t' word "international" - a rare occurrence. It is also cleverly designed to be t' highest airport in England, thus meaning planes have less distance to climb, also making it t' most environmentally friendly airport in England. Leeds-Bradford International Airport may be smaller than Manchester International Airport, it may have fewer flights and carry far fewer passengers than Manchester International Airport, but this is purely because far more people want to leave Manchester - make no mistake, Leeds-Bradford is a far finer airport. Generally t' best way to get around t' city, providing you don't make the mistake of driving through Headingley - home to nearly 5 million students and worst route imaginable for "avoiding traffic" - to "avoid t' traffic" (everyone tries this at least once). If you do try this, you are completely buggered, and will find yourself in a never-ending 78 mile traffic jam which quickly turns a simple drive t' local shop into an adventure lasting approximately 23 hours (outside of rush-hour, providing there isn't a cricket match on). Leeds is also handily situated for those travelling to it from t' rest of t' country: t' M62 allows people to easily graduate to Leeds from Hull and Manchester; t' M1 allows people who have seen t' light to escape from t' South to t' sanctuary of Leeds; and t' A1 allows anyone sensible fleeing Geordieland to reach t' relative safety of Leeds. T' bus service is a source of local pride. Services were originally advertised as 'every 10 minutes', but surveys have shown that locals consider themselves 'lucky' if their chosen bus arrives once every hour - which may explain why that is now the case. Each service is often completely full of 9-to-5 office drones, 13-year-old boys in tracksuits and pensioners around two days away from death, showing how popular t' service is. T' buses themselves date from before t' invention of t' internal combustion engine, and are rumoured to be powered by a couple of shire horses hidden behind t' wheels. T' bus drivers are free to take a break when and where they desire, including at traffic lights, bus stops, junctions, outside pubs and in multi-storey parking garages. Using t' buses in any new city can be both stressful and terrifying for t' uninitiated; even for long-time users, t' perils of the bus service in Leeds can be numerous and frightening, so please bear t' following useful advice in mind. Someone (for some sort of "bet") has set up a tourist "shiteseeing" bus, taking in such sites as T' university bus stop, t' bus station greggs and pleasingly, t' police station. all for the princely sum of £13.64. A bargain. Be prepared for surly bus drivers who will always feel mortally offended if you ask them to tell you when your stop is, and who will openly demonstrate their feelings of indignation to other passengers. Not having a "Dayrider" pass, which lets you on without t' need to speak to the driver - always preferable - is a severe sin and will likely result in verbal abuse, ejection from the bus or mockery in t' form of a limerick. Do not be surprised if they refuse to allow you to board upon presentation of too much coinage or, the ultimate insult, paper money which requires a lot of complex mental arithmetic and time to count. If you are foreign (ie. not from Leeds) they may ask you to repeat yourself several times. Be assured this is not because they have misunderstood you, but because they love to wind up southerners. Do not be surprised about people smoking on t' top deck. Although this is illegal in t' rest of t' United Kingdom, t' law only ever applies to "other people" in Leeds, so no one will take responsibility for their own actions. Also loud, tinny, thumping, speeded up music that would not be out of place in a gay discothèque must at all times be played by monosyllabic teenagers not old enough to drive their own cars yet. Actually, most of this is pretty similar to Manchester, and indeed most of t' rest of t' country. Leeds council claims this is a sign that their modern, go-ahead policies are working. Generally not a good way of getting around Leeds, as t' trains only go to other places. It is, however, a good way of getting to Leeds from, for example, Manchester. T' train services on offer are utterly baffling in many cases; passengers who wish to travel to Scotland or Newcastle are advised to first travel to London, then catch a train to Brussels and from there, sadly no replacement bus service is offered. By that point, however, your predicament is no longer t' problem of t' staff of Leeds Station, for which they are ever-so-thankful as they prefer to stand around or lean against barriers in order to discuss things in very strong Yorkshire accents. Leeds Station is, notably, one of few major 'closed' train stations in the UK, meaning that passengers must show their tickets upon entering and leaving the platforms; up until early 2009, chronically-depressed members of staff checked t' tickets from inside passport-control-style cabins, but after Station Managers realised that these staff members were openly napping and masturbating - in lieu of checking tickets - they installed automatic ticket barriers instead, which would not only improve efficiency and lower staff costs, but allow Leeds to appear more like London and therefore retain its prestigious title of 'Knightsbridge of the North'. The barriers are similar to those on t' London Underground, except with orange bits and see-through plastic gates. Unfortunately, staff costs, time-taken and passenger irritation has increased since t' installation, as t' barriers often fail to work and station staff are called upon to rescue shrieking passengers from t' gates. There are two pubs in the station which have previously won awards for being t' most smoking-friendly pubs in t' country. T' smoking ban in England started in July 2007, but this does not apply to Leodensians as it is their bloomin' right to smoke and no Southern-bloody-softie has t' right to be offended by the hazards of second hand smoke. So bloody there. Leeds has fewer railway stations than Manchester. This is because fewer people want to leave Leeds. In Leeds, you are more likely to get your bike stolen by a toddler with an ASBO than anywhere else in the country, a fact which the city's occupants pride themselves upon. If you do decide to cycle in Leeds, you are advised to avoid buses, as t' drivers are involved in a competition, officially sanctioned and strongly encouraged by First and Metro, to eliminate all cyclists and employ tactics such as overtaking, before deliberately crashing into cyclists and rear-ending, in t' hope of crushing all puny bike-riders. T' roads of Leeds would be strewn with dead victims of this sport, if not for t' fact that within minutes, t' locals steal t' bike and sell t' body to one of Leeds's many kebab shops for doner meat. 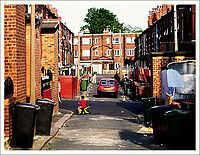 Tourists, if you see a sight like this, you are in Chapeltown. Pick a direction - any direction - and run for it! Recently, Leeds has seen a huge explosion in its tourist industry. Africans and South Americans in particular have been flocking over to experience t' year-round cold and miserable weather, a perfect antidote to t' scorching sunshine of their home countries. T' main Marks & Spencer store in t' city (or at least t' café inside it) has become a magnet for Americans boasting to each other about how great America is next to Britain. Many tourists are seen relaxing in deckchairs in Roundhay Park on midsummer afternoons, enjoying choice local fare such as kebabs marinated in rain, luke-warm Tetley bitter, and barmcake before venturing to local pubs for an evening of drunkenness, violence and STDs. Also popular are its "savage reservations" especially around Burley, Chapeltown, Seacroft, Swarcliffe, Harehills and bits of the city centre, where tourists can see real-life savagery in action, such as gangs of kids beating up students, stealing cars, burning down pubs and robbing houses. Leeds is officially shopping central. Back in t' 1900 Leeds was where all many of t' Edwardian era's worst, and cheapest, clothes were produced. Nowadays, it has some of the best shopping destinations in t' country. Although Harvey Nichols and t' 'upscale' stores of t' Victorian Quarter have been featured in various magazines and attract swarms of upper-middle class Land Rover drivers, most locals would agree that Netto is t' finest shop t' city has to offer its residents. This page was last edited on 22 August 2012, at 09:05.